You can save 20% on distribution fees by using our Bulk Discount offer. If you place an order within the Bulk Discounts section of your account, with a value of £100 (GBP), $175 (USD), €132.50 (EUR), R2000 (ZAR) or greater, a 20% discount will automatically be applied. Credit will then be applied to your account (for the full, pre-discount amount), and to use it to pay for distribution in the future, just select the “Pay Using Bulk Discount” at checkout. In the example above, we have a Bulk Discount order for 2 separate singles (containing 1 or 2 tracks each), and 3 separate albums (containing 6 to 20 tracks each). The combined price for this order, if you paid for each of them separately, would total £199.75 / $339.85 / €259.85 / R 3975.00 depending on which currency you choose to pay in. £39.95, if paying in GBP. $67.97, if paying in USD. €51.97, if paying in EUR. R 795.00, if paying in ZAR. 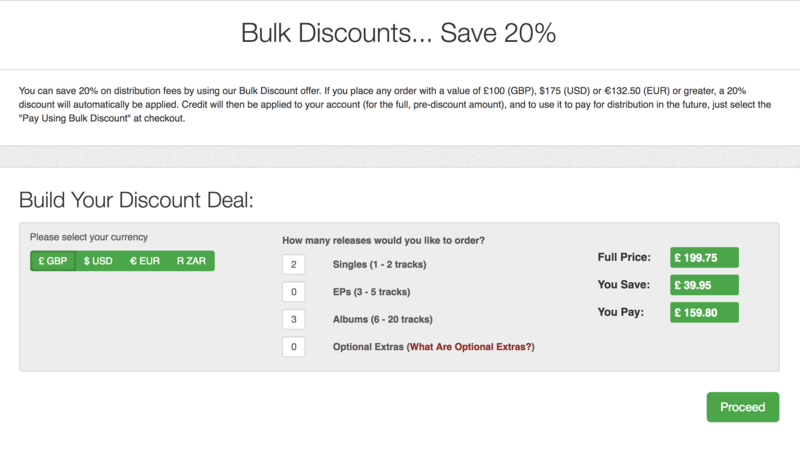 Bulk discounts are a great way to save money if you’re planning multiple releases, however there are a few things we need to make you aware of before you complete your purchase. When you’re building your bulk discount, once your order reaches a (full-price) value of £100 (GBP), $175 (USD), €132.50 (EUR) or R2000 (ZAR), a 20% discount will be applied automatically. This means that you get the full-price value of the order applied to your account as bulk discount credit, but you only pay the discounted price. You can then use this credit to pay for future orders for distribution (audio, or video, or mixed media) and for optional extras (charts registrations and Gracenote registration). 1) Bulk discount credit can’t be used when ordering Mastering. 2) Bulk discount credit can’t be transferred to a different EmuBands account. 3) Bulk discount credit expires after two years – so please don’t order too much! 4) Part-used or expired credit can’t be refunded – again, please don’t order too much! 5) Refunds can be given with 30 days of purchase, as long as none of the credit has been used. For more information on our prices, and to get started, click here.